Any exposure to the water in Kiser Lake is dangerous due to high algal toxin levels, according to the Ohio Department of Health’s BeachGuard service, which elevated its warning to a “danger” level and disclosed the latest data showing high levels of the toxin. ST. PARIS – Beachgoers planning to spend the Fourth of July holiday enjoying a swim at Kiser Lake State Park may want to rethink their plans after test results of the water showed unsafe levels of microcystin, a toxin produced by cyanobacteria or harmful algal blooms. 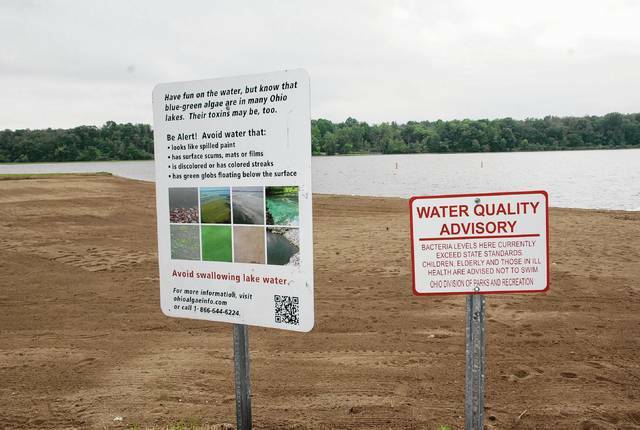 Eric Heis, a spokesperson with the Ohio Department of Natural Resources, said Friday that on June 28, ODNR – which monitors the lake on behalf of the Ohio Department of Health (ODH) – issued an “elevated recreational public health advisory” for Kiser Lake. According to information posted on BeachGuard, a website used by state beach officials to post monitoring data and notifications, the advisory is due to the level of microcystin in the water being recorded at 25 ppg (parts per billion), which exceeds the state’s threshold of 20 ppg. “At the current level, everyone is advised to stay out of the water,” Heis said. He added the elevated advisory is just that, an advisory letting people know the water possesses health risks if ingested. The advisory isn’t something enforceable by law. “We don’t keep people out of the water, close beaches or close parks,” Heis said. From June 21 to June 28, Kiser Lake was under a regular “recreational public health advisory” after the toxin levels came back at 11.7 ppg, well above the 6 ppg advisory-triggering threshold. Under this advisory, Heis said, ODH recommends pets, children and pregnant or nursing women refrain from swimming or wading in the water. Heis said the “elevated” advisory will remain through at least the Fourth of July holiday as tests are conducted on a weekly basis. Kiser Lake won’t be tested again until July 5. Until then, all caution signs will remain in place. This weekend, Buckeye Lake’s beaches (Fairfield County) and those at Grand Lake St. Marys (Auglaize County) are under the same elevated advisory as Kiser Lake.